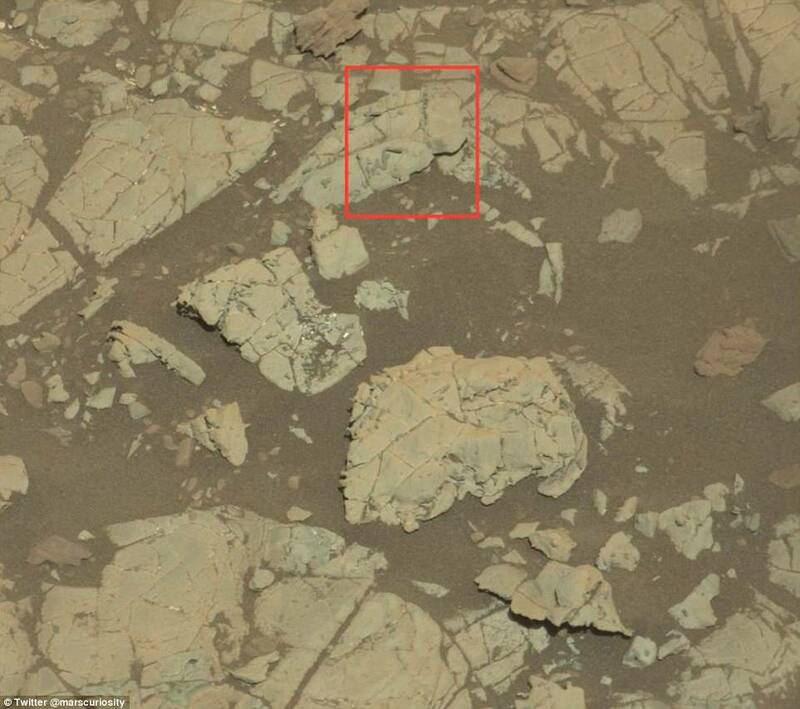 NASA’s Curiosity Mars rover has spotted a set of mysterious ‘stick-like figures’ on the red planet. 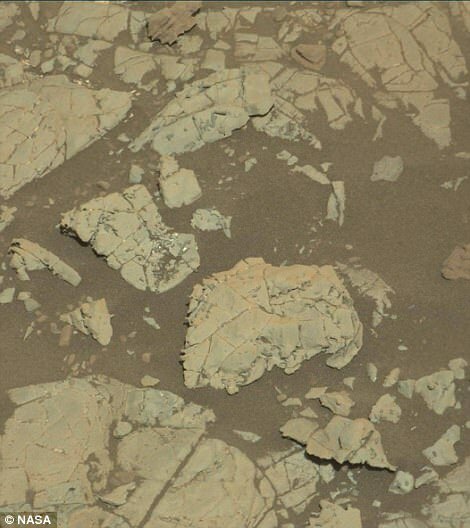 In a photo shared to the rover’s Twitter account this week, NASA revealed a look at the unusual formations recently discovered on the face of a Martian rock. It’s unclear what exactly created the quarter-inch-long ‘stick-figures,’ though the space agency says they could be crystals or minerals left in the gaps where crystals dissolved. 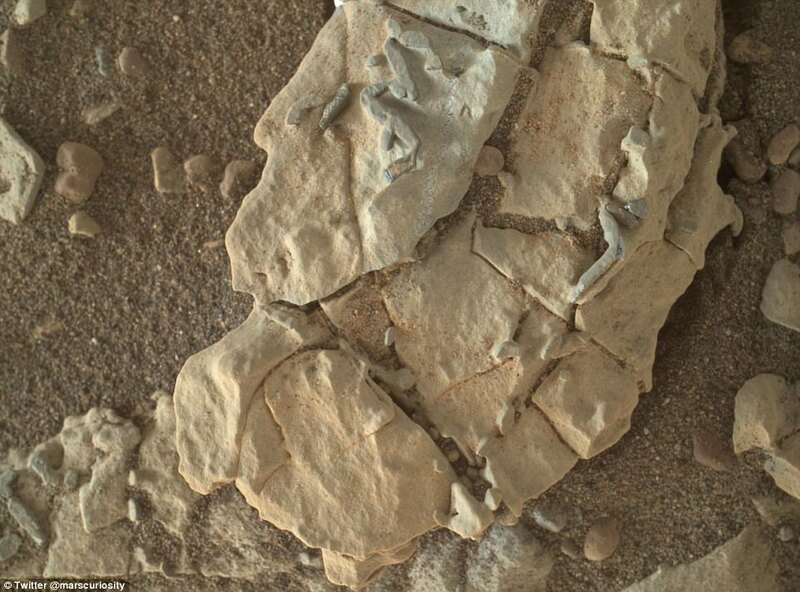 The images were captured during the rover’s ‘working holiday’ at the end of December. Images captured from orbit with the Mars Reconnaissance Orbiter’s High Resolution Imaging Science Experiment camera reveal the region has some unusual blue hues. And, it’s also home to a number of darker toned ‘stick’-like features. 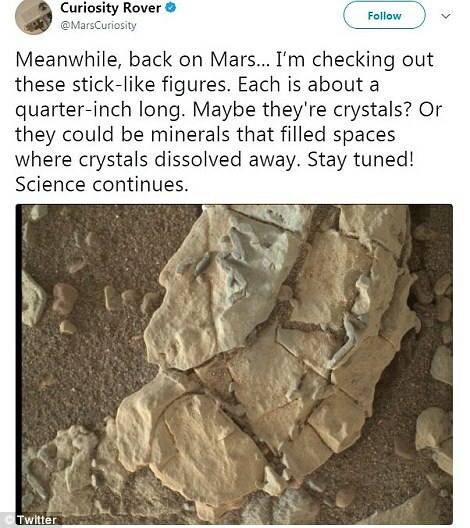 ‘Meanwhile, back on Mars…I’m checking out these stick-like figures,’ the Curiosity rover's Twitter account tweeted on Wednesday. ‘Each is about a quarter-inch long. Maybe they’re crystals? 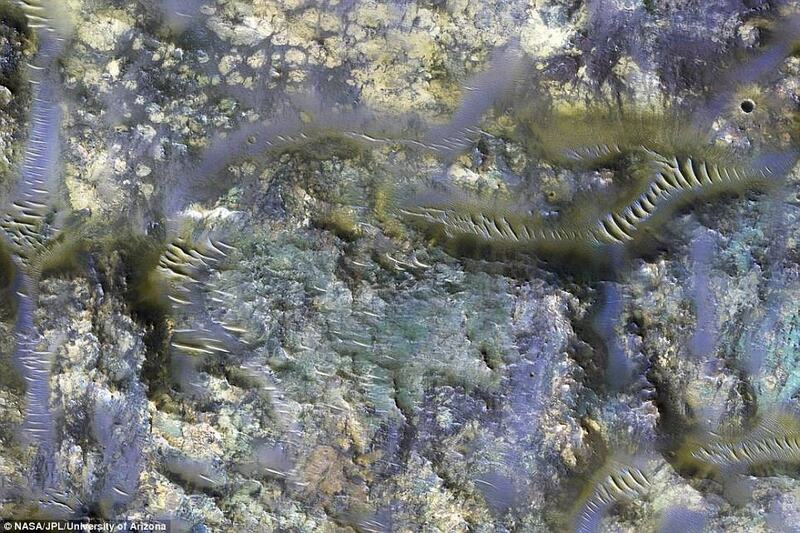 Or they could be minerals that filled spaces where crystals dissolved away. NASA's ongoing Mars missions have revealed countless remarkable features on the surface of the red planet over the last few years. An image captured recently by NASA’s Mars Reconnaissance Orbiter offered a stunning look at Mars’ northern Meridiani Planum, where swirling deposits appear as though they’ve been slashed by massive faults. 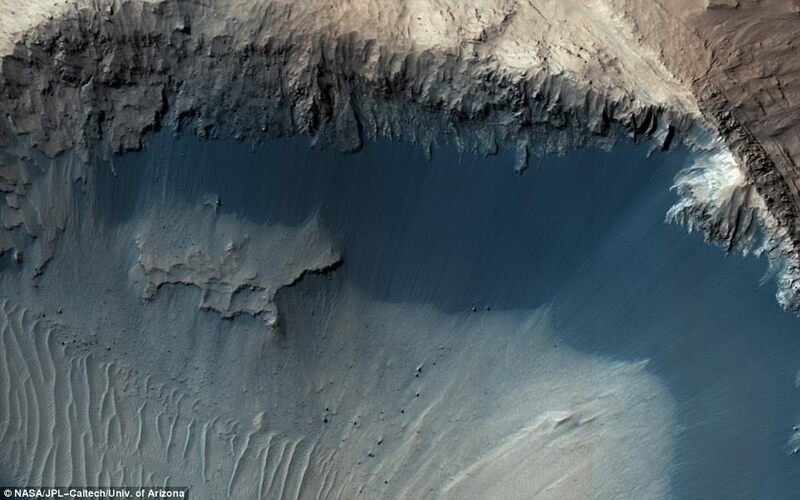 The amazing view shows the different effects of fault activity on the Martian surface, giving rise to everything from clean breaks to ‘stretched out’ distortions. This is likely an indication that the faults formed at different times, when the layers were at various stages of hardening. 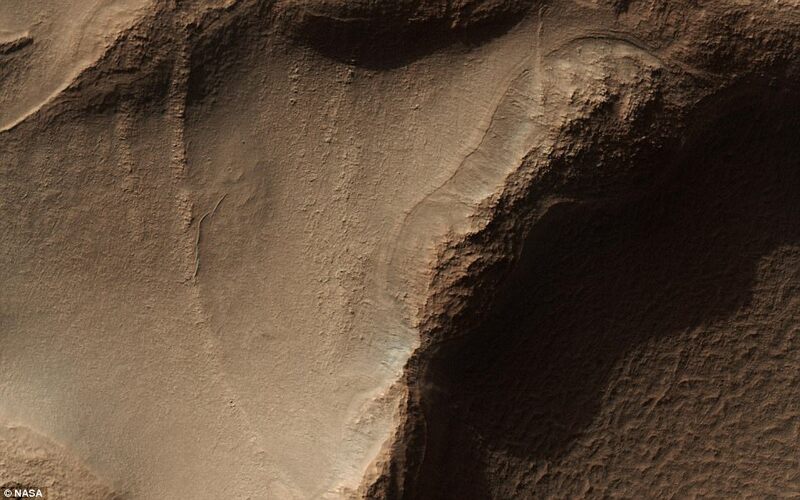 In a second image offering a closer look at some of the features, NASA has pointed out where the faults have displaced individual beds. These areas, as noted by the yellow arrow, are where the faults produced a clean break. 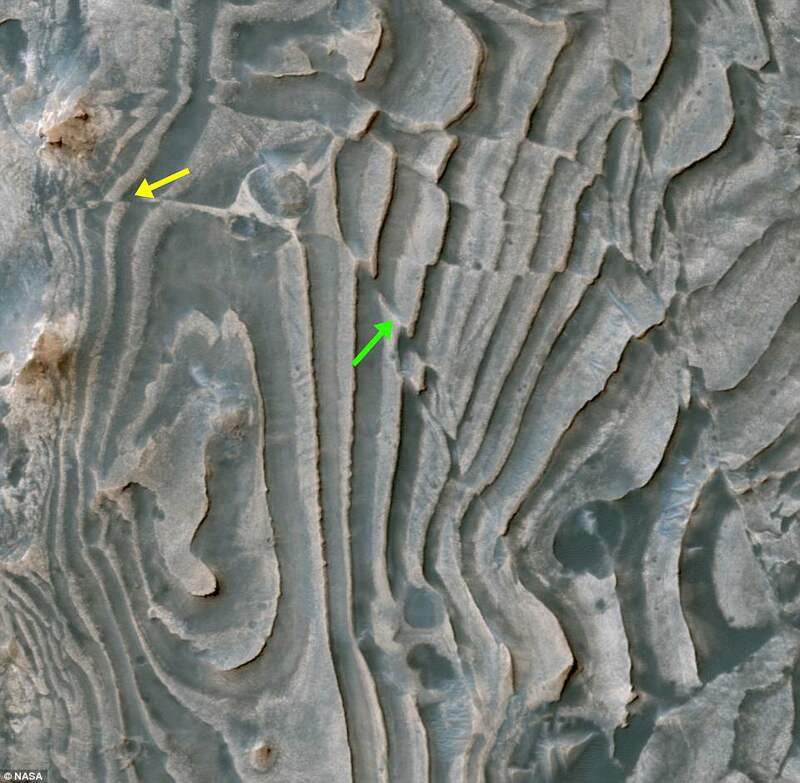 In other regions, as noted by the green arrow, the layers appear stretched out as they span the fault. ‘These observations suggest that some of the faulting occurred while the layered deposits were still soft and could undergo deformation, whereas other faults formed later when the layers must have been solidified and produced a clean break,’ NASA explains. 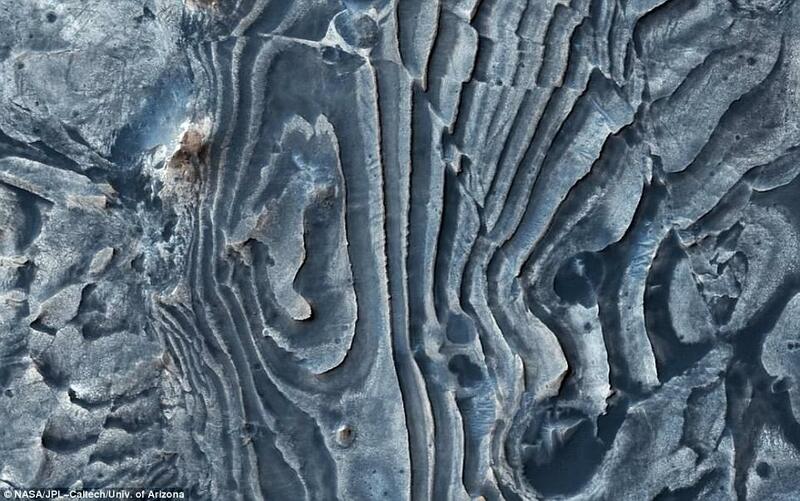 Speckling the surface of one of Mars’ oldest impact basins, NASA’s Mars Reconnaissance Orbiter recently spotted a sprawling expanse of ‘honeycomb’ landforms, with individual cells of up to 6 miles wide. Last month, scientists provided the best estimates for water on Mars, claiming it once had more liquid H2) than the Arctic Ocean - and the planet kept these oceans for more than 1.5 billion years. 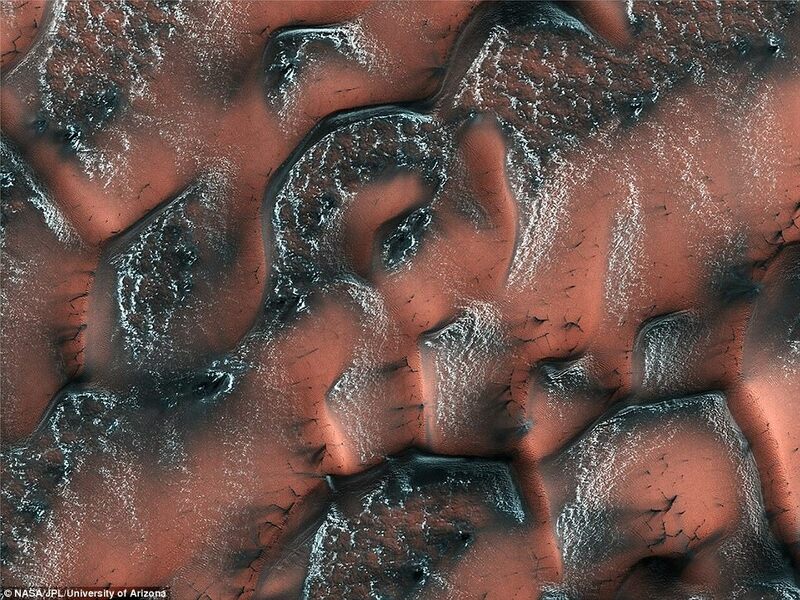 ‘Over the winter, snow and ice have inexorably covered the dunes,’ NASA explains. 'Unlike on Earth, this snow and ice is carbon dioxide, better known to us as dry ice. Earlier this summer, an infrared image from MRO showed a look at worm-like fissures blanketing the floor of a mysterious crater on Mars.